The tone has turned up a notch in the big cities of the Moroccan Sahara, where separatism advocates at bay became provocative at the call of the Polisario leadership. Utterly baffled by the rejection of the proposal to expand the MINURSO mandate to monitoring of human rights in Western Sahara, the Polisario Front leaders found no other alternative better than pay their pawns and incite them to cause trouble in the disputed territory in order to provoke Moroccan security forces and compel them to commit the irreparable. 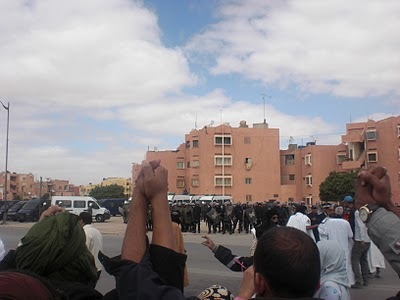 Since the adoption on April 25 by the Security Council of the UN resolution renewing the MINURSO mandate for one year, the Sahara separatists have been staging demonstrations in Laayoune and Smara claiming the independence of the territory. The protesters claim that their demonstrations are peaceful, but they resort to all means to provoke the law enforcement agents. Unleashed hordes of women and young people, often hooded, have seized the opportunity of the presence in the region of visiting US and British journalists and Western parliamentarians to “sell” photoshopped images “documenting” human rights violations allegedly committed by Moroccan security forces. Analysts believe that the Polisario and its Algerian mentors are making a big miscalculation, because such provocative actions are unfolding before the eyes of foreign journalists and observers who came to Western Sahara especially to assess the situation of human rights. At the end, journalists and observers will have an unpleasant surprise: these Sahrawi demonstrators are mere troublemakers who attack the police. It is not the other way round. The instigators of this strategy are finally caught in their own trap and will find it hard to stop this masquerade that will probably be very costly to them in future UN negotiations.